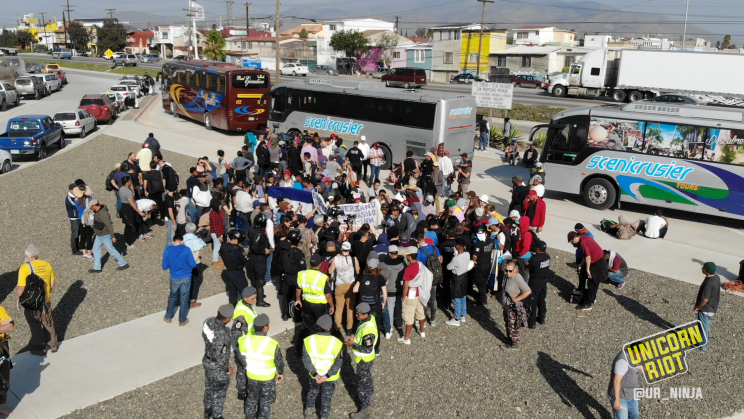 Tijuana, Mexico – After fourteen days of an ongoing hunger strike to bring attention to human rights violations against the migrant caravan, members of Pueblos Sin Fronteras met with Mexican officials at the National Institute of Migration (INM). 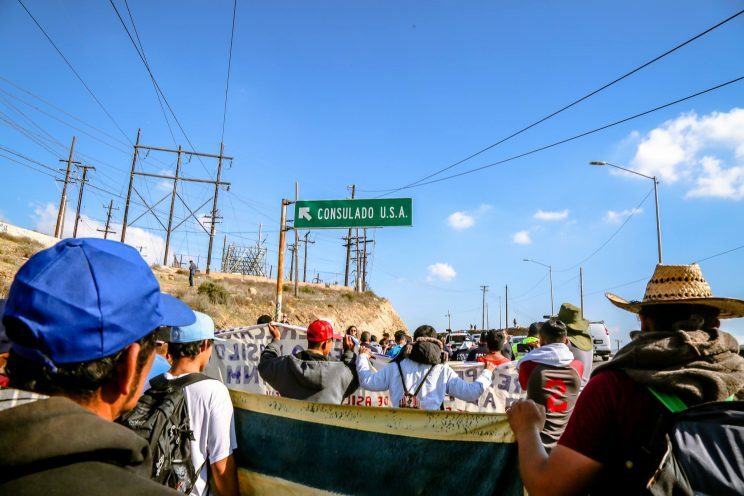 They also met with U.S. Officials at the U.S. consulate in Tijuana, Mexico, before ending the strike on Tuesday, December 11, 2018. Members of Pueblos Sin Fronteras, migrants, and allies, rallied in front of the INM offices before a few representatives went inside to meet with Mexican officials. 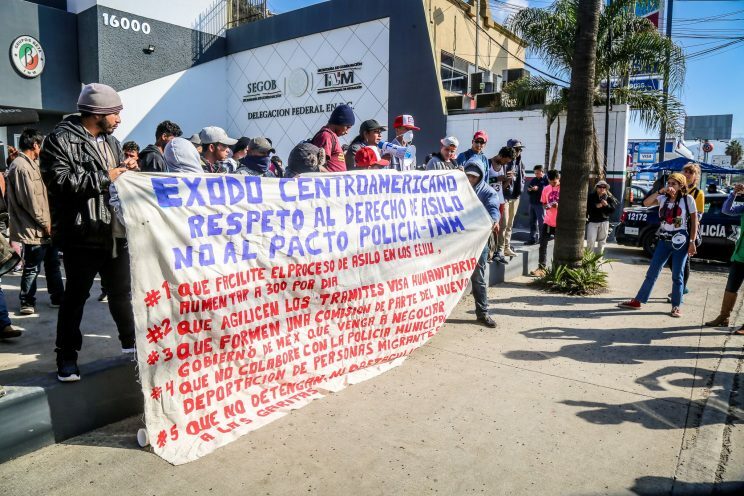 The strikers wanted the INM to stop its cooperation with Tijuana Municipal Police forces, which has led to a string of deportations. They also wanted clear numbers from authorities of migrants deported, of those who returned voluntarily, and who’d been detained. The over two hundred people in the rally waited for forty-five minutes before the representatives returned. The representatives announced to the crowd and the press that the INM officials answered some of their questions. They were also told by INM officials that “twenty-five refugees” who expressed fear of returning to their countries and asked for asylum in Mexico are detained by the INM in a detention center. The speakers asked that those detained be released. The representatives also learned that no one had been deported for over two weeks as of December 11, 2018. No information on their demand of breaking the cooperation with municipal police and migration officials was shared. When they arrived at the U.S. consulate, they were met with a line of Mexican federal riot police. The march went into a designated protest area, and two members of Peublos Sin Fronteras were escorted past the police line to meet with United States officials at the U.S. Consulate. They returned and stated they had met with a US official named Anna, and that they felt the conversation was good and professional. They had delivered a letter they read to the press that gathered. In the letter they restated their hopes that the United States would increase the amount of people being processed for asylum to 300, which they claim is the San Ysidro port of entry’s capacity. 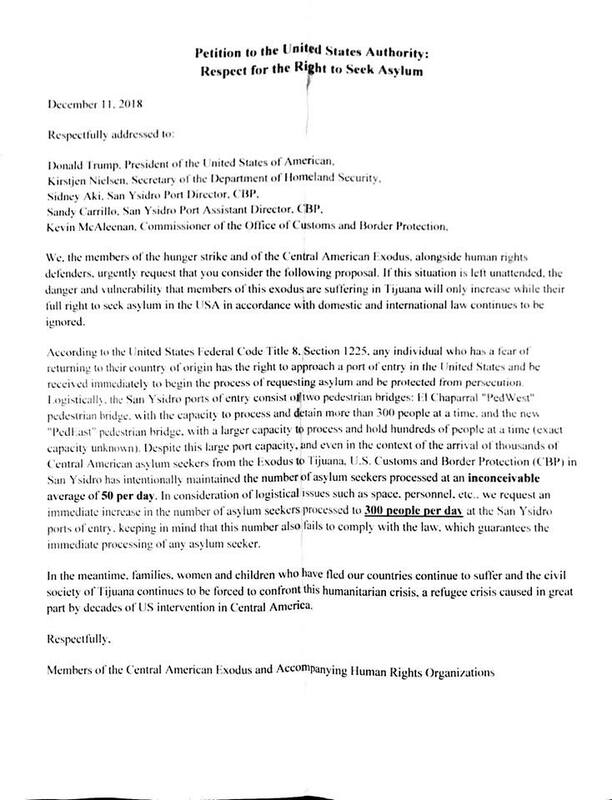 December 11, 2018 members of Pueblos Sin Fronteras delivered this letter to the U.S. Consulate and ended their fourteen day hunger strike. Peublos Sin Fronteras closes out hunger strike in front of U.S. Consulate. The rally ended with a ceremony closing the hunger strike.